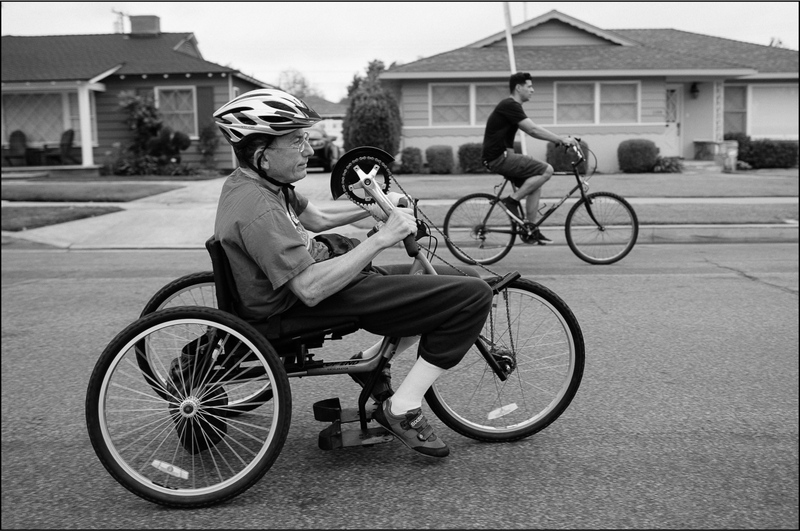 Arthur Blaser rides his tricycle with Isaac R. Larios around his neighborhood on Wednesday, July 22, 2015. Larios assists Blaser every weekday; they meet every morning at 6:40AM to exercise. 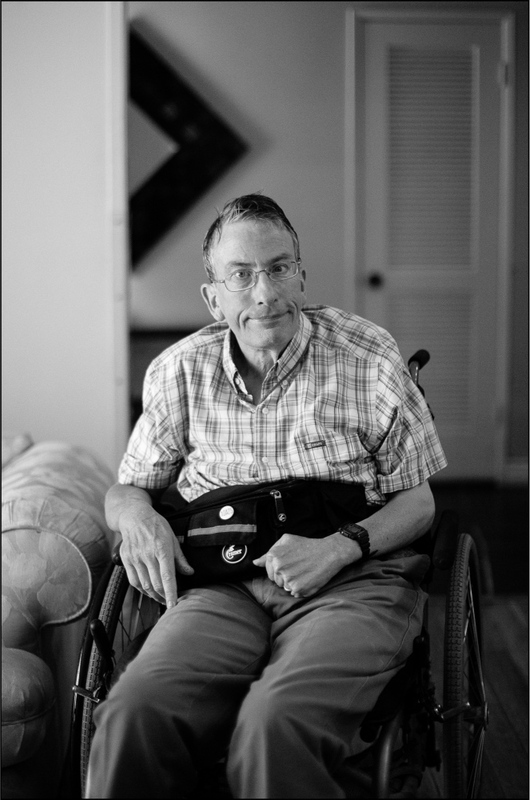 This picture story depicts Arthur Blaser’s personal and professional life through his journey as a professor and long distance runner to his sudden experience of quadriplegia and fatherhood to becoming one of the county’s leading advocates for disability rights and disability law. The interview provides a larger narrative of the Americans with Disabilities Act on its 25th anniversary, in particular the impact the legislation has had on Orange County communities. The following is a transcript of a one-on-one interview with Dr. Blaser. Can you tell me about the circumstance surrounding your disability? On May 3, 1993, I got up in the early morning. 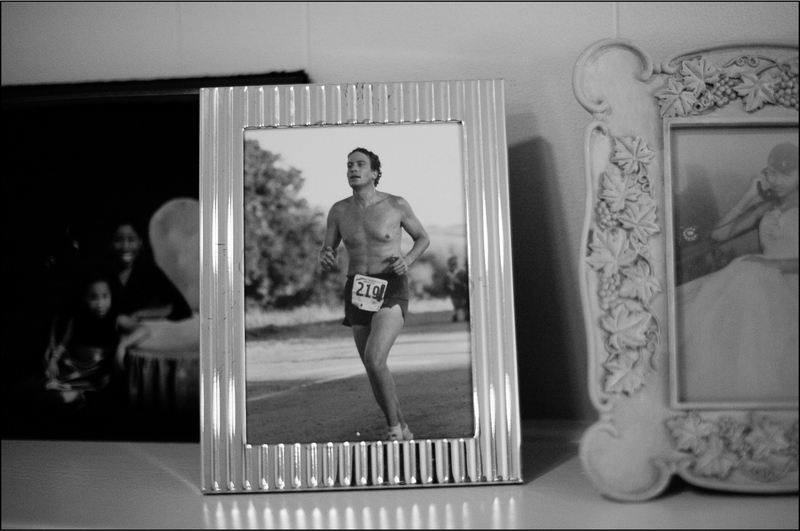 I ran several miles, as I often did. Later that same morning, I had a chiropractic adjustment. As the result of a brain-stem stroke I had while in the chiropractor's office, I am now unable to walk without assistance, my speech is impaired, and my left side is paralyzed. Actually, yes, but I was kind of more terrified because I remembered thinking I had a 9:30AM appointment at Chapman. I later met the student at a 4th of July fireworks event. It had been ten years or so. Did you pursue any legal action against the chiropractor? Yes I did. Actually, the chiropractor that caused the stroke, (we) couldn’t find him. The individual’s whose office it was at, we had a settlement with his insurance company...The other individual, as far as I know, is not practicing. It’s very possible that he entered a new identity or is in another state. I know that some people will say, "Well, gee, chiropractors aren't regulated,' and it's probably true. But I don't want to spend all my life going after chiropractors. 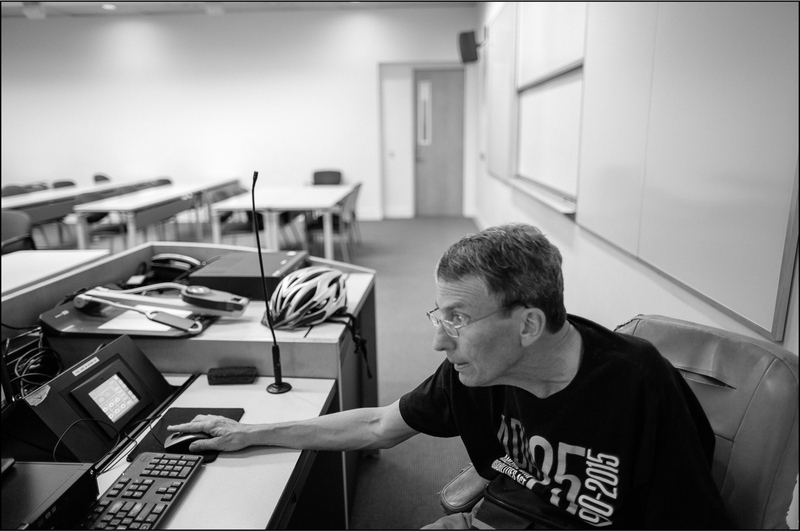 Art Blaser prepares for his Fall 2015 courses by checking the classroom that operates TextAloud, a software that converts screen words into spoken words. 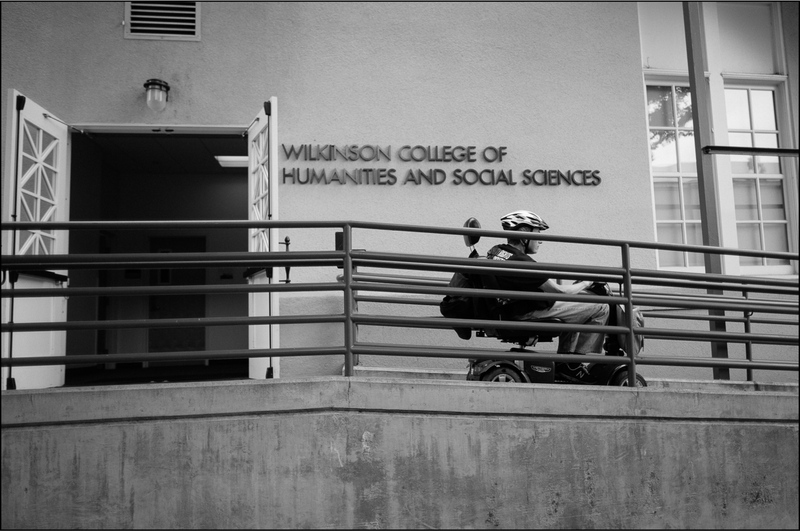 Blaser uses assistive technology to teach at Chapman University. July 17, 2015. 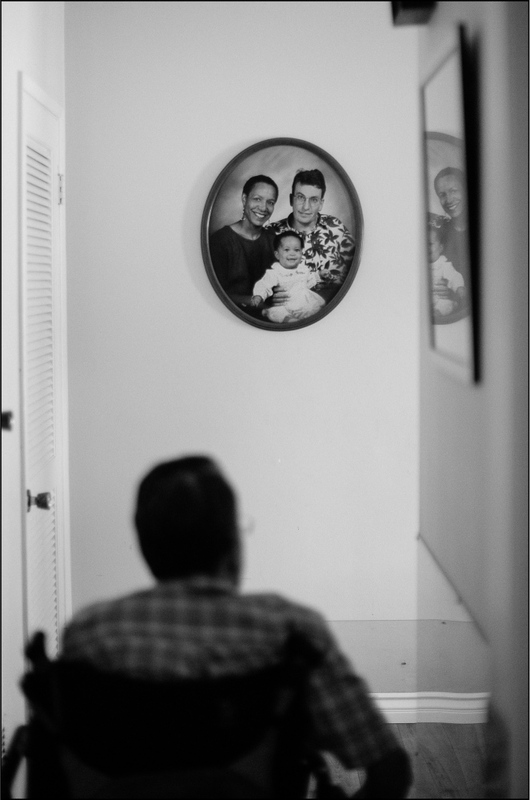 How do you look at your life differently now and before your disability? Has it changed your perspective? It probably has, but I'd say not as much as some people would think that it would. I've always been sort of interested in politics and society. I always liked to teach at Chapman. And it's always been where some things come easy and other things don't. This was one more of the sort of things that aren't going to come easy, like figuring out how other people teach from a chair. Can you describe a time when you felt most satisfied with your work? How about right now? I’d say, I'm 80% content. Because if it was 100, then you’d think "Well, gee, I’m content. I don't have to do any more". Or if it’s 50, I’d think, "Oh gee, I feel terrible." Along the way, you win some things and you lose some things. Inevitably, you have some classes that go well and some classes that go poorly. Last term, one class was very positive; the other, they were disappointed. I could overly analyze it. Either way, I think it's important to take things in strides. I have a few things written that I’m kind of proud of and a few things that I hope to write and also a few things in the community that I’m involved in. Probably the article I like most is in the Futurist called “A Brilliant Future with Disabilities.” I think that would have been in '99. The gist of it is that I know that a lot of people may say, “Oh no. I might get a stroke. I wont be able to do anything. I'll have to use a wheelchair.” In the end of the day, there's going to be a lot more disabled people out there because they are living longer. That, by and large, is a good thing. Arthur Blaser prepares for his upcoming Fall 2015 Introduction to International Relations course at Chapman University with the assistance of Sarai Urzua on Thursday, June 11, 2015. 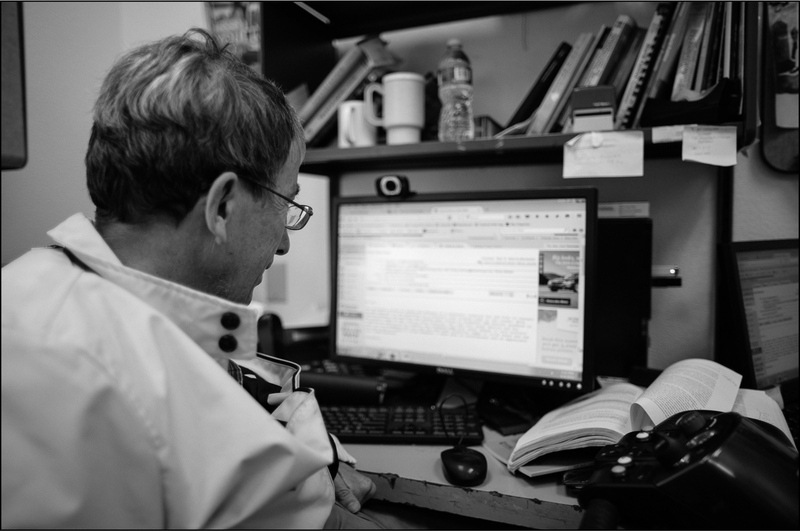 Blaser uses dual screens to allow Urzua to type course instruction. 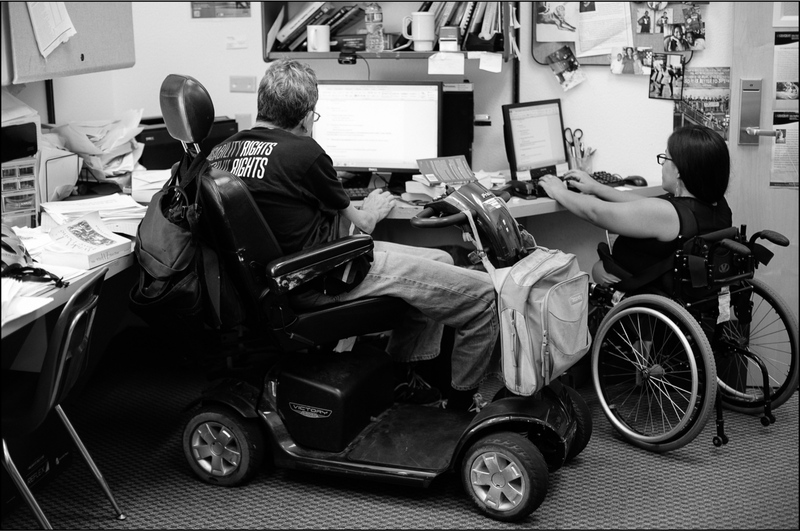 Currently, one of the big projects I’m working on is the link between Peace and Justice Studies and Disability Studies. I hope eventually it’d be a book. It was once an article in the Peace Journal in 2012 that I wrote with a law student named Samuel Schleier and Angeliki Kanavou, who taught peace studies here (at Chapman). When will you release the book? I think it will be another four years or so, in part because I write things very slowly and in part, well, I like spending time with my kids, whether they like it or not. 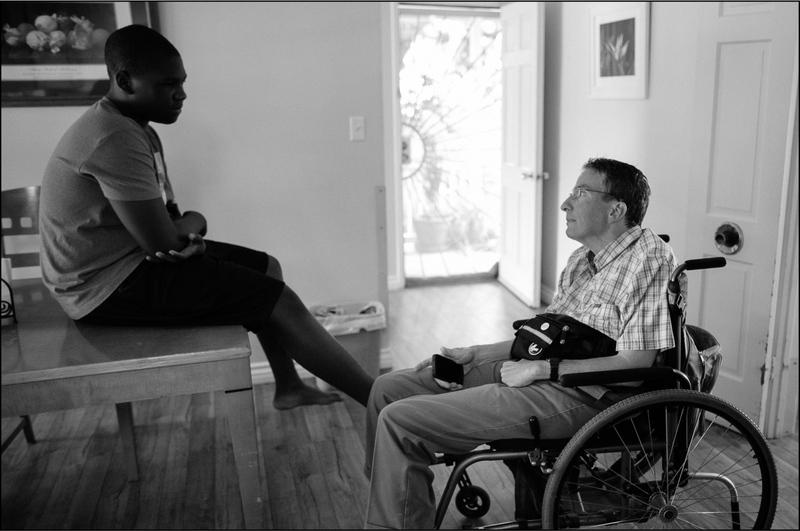 Blaser with his fourteen year old son, Marcus, at their home on Wednesday, July 22, 2015. — Arthur Blaser, "A Brilliant Future with Disabilities"
Has the role of fatherhood (and husbandhood) changed with your disability? It has, but again I think in the way that everything changes.It's like the difference being older as opposed to being younger. It's hard to say. It's not the same as being 60 as it was being 10 years old. Is it the same being a parent and a disabled parent? Well, part of it that I've never been a non-disabled parent. LIke although it's possible to change a baby's diaper with one hand, it's hard and it's also kind of hard for the baby too, although, not necessarily. A lot of parents do it really well. The thing is actually my wife can do it a lot quicker than I could, so essentially I think I did support her in other ways. Arthur Blaser receives his first correspondence from Frank Sun of the City of Orange regarding a Street Service Request for an ADA ramp on the southwest corner of Grand and Palmyra on Monday, June 1, 2015. Let’s talk about the ADA. For people who don’t know, why is the ADA important and why should we be celebrating? It’s an important civil rights statute. It really signifies a change between a hierarchical view of disability and people need to be taken care of daily. That people with disabilities are like anybody else. They have rights. They have civil rights. We've come 25 years. That bill was mostly about equal access and equal protection. Over the next 25 years, what do you think that large banner would be that people with disabilities will support? I think society in general, a lot of the discussion pertains to equal opportunity which is important, but there's not equal conditions which I think means in effect that people haven't got an equal opportunity, not just with disability but also with gender, you name it. I think an important factor is things like the affordable care act and medical care because it will either wipe out people completely if they don't have insurance or there will be a problem if people do have insurance. In my own case, for instance, I did have insurance before the stroke. And that makes a big difference. 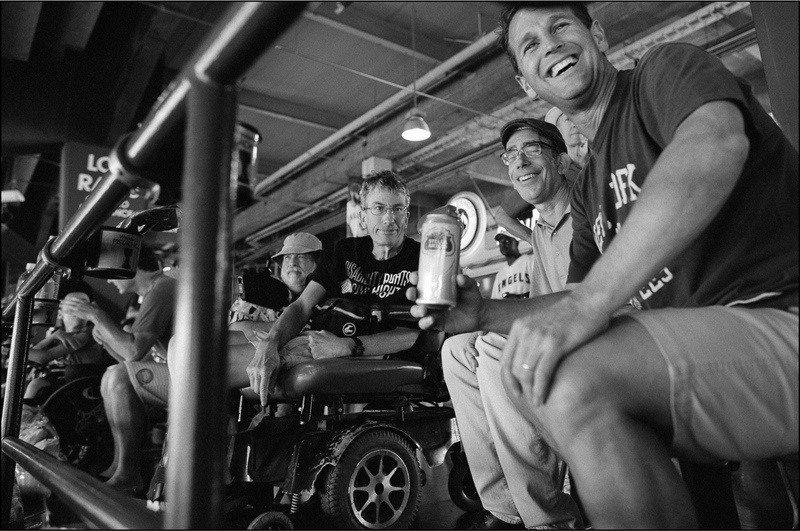 What do you think is the biggest challenge that people with disabilities face today? I think there are a lot of them, but I think a big one is institutionalization across the board. (The biggest challenges are) for people who either don't have economic resources or are at a large institutional hospital. It's the idea that people can't get by on their own, therefore, they need to be in some sort of a hospital. The greatest (challenge) I think are with people who are in nursing homes and people with psychiatric disabilities at mental hospitals for whom ideally there'd be support services in the community but there are sufficient ones, unfortunately. Can you give me some examples of this in Orange County? We talked about the legacy of the ADA. Have you ever thought about what you would like your legacy to be?